Many People inquire me about Using Automobile Battery in Invertors, even some technicians in the Inverter field are also not too clear about this issue. So, I want to write a post about this issue and clarify the doubt of newbies and some professionals. 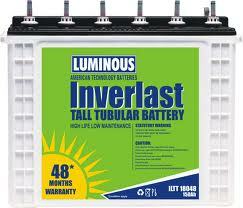 Normally in inverter field, many Battery power store owners are selling automobile batteries for inverters. They are not aware of the properties of automobiles batteries. Actually the automobile batteries have more number of lead plates to facilitate quick and large amount of power output during engine starting. They give large amount of power for few seconds to start the engine, not continuously, Whereas the Inverter batteries give steady power output for long time. Conclusion: Using automobile battery in inverter application is not recommended .